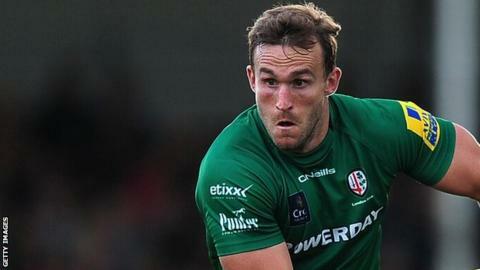 London Irish went to the top of their European Challenge Cup pool with a bonus-point win against Edinburgh. Winger Andrew Fenby scored a hat-trick as The Exiles, bottom of the English Premiership, ran in six tries in total. The hosts secured the try-scoring bonus point before half-time, with Alex Lewington, Johnny Williams and Aseli Tikoirotuma all going over to seal an emphatic victory. Greig Tonks kicked two penalties for Edinburgh's only points of the game. Fenby, making his first start since the opening Premiership weekend, cut inside from the blindside wing from halfway to cross for his first try before squeezing over in the corner four minutes later from Sean Maitland's pass. Winger Lewington then found space behind Edinburgh's back line for Irish's third try on 27 minutes after picking up a reverse pass 40 metres out. Irish had the bonus point in the bag as Williams snuck over in the corner before the break for his fifth try in four games. Edinburgh saw more of the ball in the second half, but could not break down their opponents. Centre Tikoirotuma added the fifth try on the hour and Fenby completed his treble, running on to a kick over the top from Lewington. Irish move to the top of Pool Five and face Edinburgh again at Murrayfield on Friday in their next game. "We're certainly happy with the win and happy with certain aspects of our game. "We scored a few really nice tries, a couple that we've been working on for a few weeks and haven't quite pulled off previously. "We're delighted for him. He's been frustrated and we've been having regular chats on where he's working on his game. "He's taken on that feedback and he's working hard on his game and he's got the rewards." "We were very poor. Our strength in depth was found wanting. "Our defence was the worst I have seen this season and our inability to finish was poor. "We must have had five opportunities to score and didn't take any of them." London Irish: Maitland; Lewington, Tikoirotuma, Williams, Fenby; Geraghty, McKibbin; Court, Ellis, Franks, Sheriff, Sinclair, Narraway (capt), Gilsenan, Treviranus. Replacements: Stevens, Smallbone, Halavatau, Sisi, Cowan, Allinson, Brophy-Clews, Waldouck. Edinburgh: Fife, Brown, Allen, Strauss, Katoa, Tonks, Fowles; Sutherland, Cochrane (capt), Andress, Bresler, Toolis, Ritchie, Watson, Du Preez. Replacements: Turner, Shiells, Berghan, Bradbury, Dean, Hidalgo-Clyne, Kinghorn, Hoyland.